SOME of the most interesting trains in the country are those which carry the mails. In the old days the mail trains were the best and fastest by which passengers could travel; to-day the postal business is so enormous that in the case of the more important night mails, there is no room for passengers at all. Such a train, for example, is the famous “West Coast Postal”, which leaves Euston terminus for Scotland every evening at half-past eight, and carries all the Scottish mails from London and many other parts of England. Up to the very last minute before starting Post Office motors and carts come dashing up from all over London, and shoot their contents into the long train of mail-vans. Parcels go into big open vans, where they can be easily handled; but letters go into what are known as the “sorting tenders”, which have long benches down each side, and enormous racks above with hundreds of pigeon-holes. Then, as soon as the “right-away” is given - and when you probably are fast asleep in bed - the whole train becomes a hive of activity. Bags are emptied out; and letters are sorted and tossed into their right pigeon-holes - according to where they are addressed - almost quicker than your eye could follow them. The first stop of the “Postal” is at Rugby, eighty-three miles down the line, but there are also other important towns on the way, such as Watford or Bletchley, that want to send their letters to Scotland. As the train gets further down the line, too, all the towns and villages passed by the “Postal” are anxious to receive their dispatch of letters from London. How are these exchanges to be made without stopping the proud “Postal” on her course? If you could squeeze yourself into one of the sorting coaches, well out of the way, you would be able to see the prep-arations made as the train approaches one of these places where letters are to be exchanged. The bags full of letters have been done up into stout leather pouches, as they are going to be roughly handled; then the pouches are hung on to arms fixed on the side of the coach, which are arranged to swing outwards, clear of the side of the train. The last preparation is to open out a great net, made of the stoutest rope obtainable, and normally folded neatly into the side of the sorting coach. Meanwhile, postmen have been hurrying from the towns or villages towards the apparatus where the letters are to be exchanged. Each postman, too, does his postbags up in leather pouches, and, mounting the ladder of the tall standard by the side of the line, he hangs on his bags, and swings them out towards the line, just as the roar of the “Postal” is heard in the distance. On the ground beside the standards you will see the big ground-net, very much like the net at the side of the sorting coach on the train. Now the express, at a mile-a-minute or more, flies past the mail apparatus. In the picture below you can see the actual exchange taking place. 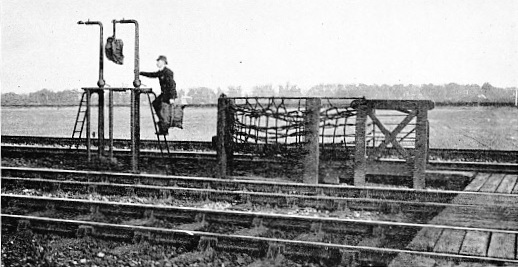 The train net has neatly “collared” the postman’s bags off the tall ground standard, and the ground-net has just as neatly swept the bags off the arms at the side of the train. In a second it is all over; and a moment later the postman is carrying his bags of London letters to his village post office, while the busy sorters on the train are pigeon-holing the new letters that have just arrived. So the work on the “Postal” goes on, right through the night. 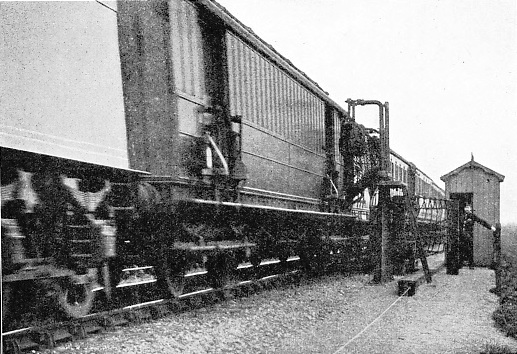 At only the biggest stations and junctions does the mail train of to-day require to stop; for there much greater quantities of mail matter have to be exchanged than the apparatus could handle. You can read more on “Travelling Post Offices” and “The West Coast Postal” on this website.